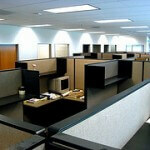 It’s a fairly common perception that high cubicle walls restrict workplace socialization. Read enough office furniture blogs and you’ll see the notion tossed around that “cubicle dwelling” employees feel cut off from personal interaction. Walls that come up above head height when users are seated are blamed for this sense of alienation. But what if higher cubicle panels actually improve connection and communication in the workplace? Cubicle panels don’t prevent friendly and amiable interaction at work. What they do is limit interruptions (a polite term for unwanted socialization). When it takes a little more effort to have a face to face talk with a coworker, people are more likely to consider whether what they want to say is really that important. The quality of workplace communication and connection can also increase because higher walls afford introverted workers with more privacy. Not everyone enjoys being stuck in a room full of people all day at work. Having better boundaries helps less social employees cope. This means when they do choose to interact with others, they are likely to be more relaxed and friendly. Good fences really do make good neighbors. One nice thing about OBEX panel extenders is that you don’t have to put them on every cubicle if some workers prefer the lower dividers. This flexibility provides employers and employees with an unprecedented level of control over the flow of conversation and socialization in the workplace.